A sheen monster even on ordinary copy paper, with good flow and lubrication. Nice one. An Australian correspondent wrote part of a recent letter with this ink, and I loved it. Looked for it and have not found a U.S. source so far. Inquired on another thread but have not had a response. I would love to get a bottle or it. I believe they are available at Anderson Pens. Thanks! Yes, they do have it. Thanks, the great reviews I get daily help brighten the day. Why, yes! In such a case, ink is a good medicine. All best wishes. But don't take too much of it!! Oops, just realised I forgot the water test. My bottle arrived last week. This review makes me want to use it now. It has to wait until my pen uses up the rest of the Bung Box Tortoise Shell Brown. Nice one! Hope you feel better! 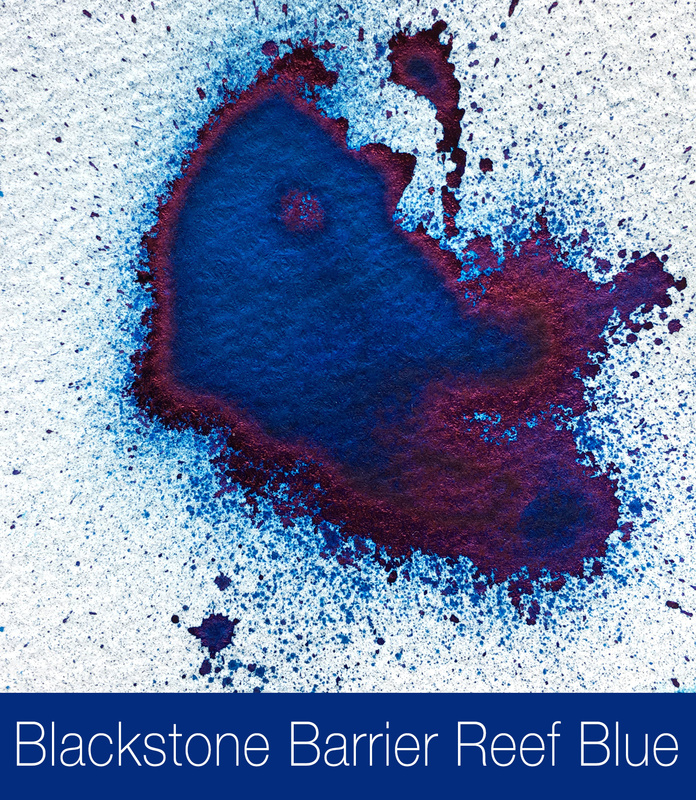 Blackstone Barrier Reef blue reminds me of Bungubox First Love Sapphire and Parker Penman Sapphire, colorwise. 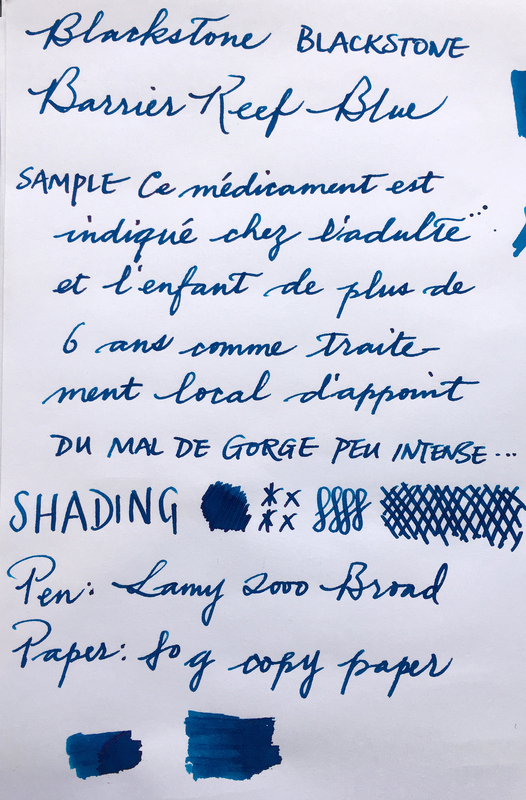 Thanks so much for a thorough review of this fine ink, Lgsoltek. Between you and Visvamitra, I never run out of ways to spend my money. 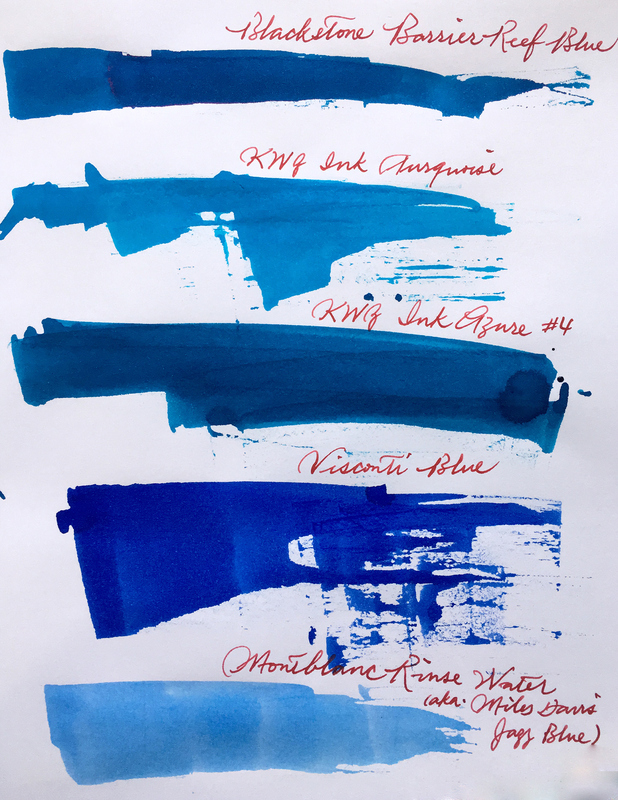 Too bad I have several inks with similar hues already, otherwise it should be a great everyday blue. 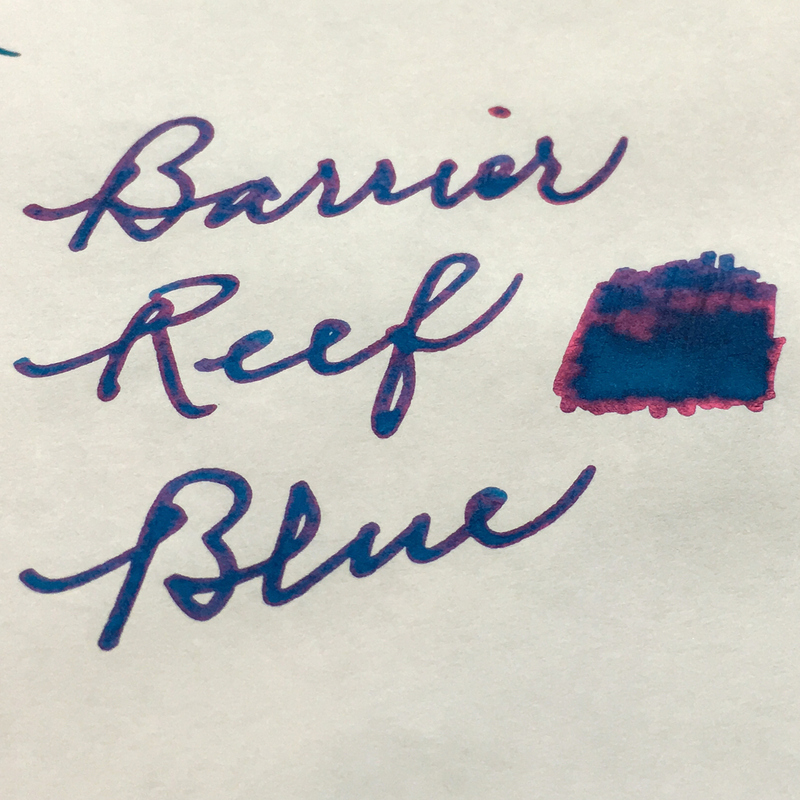 The sheen is lovely but the color doesn't excite me. 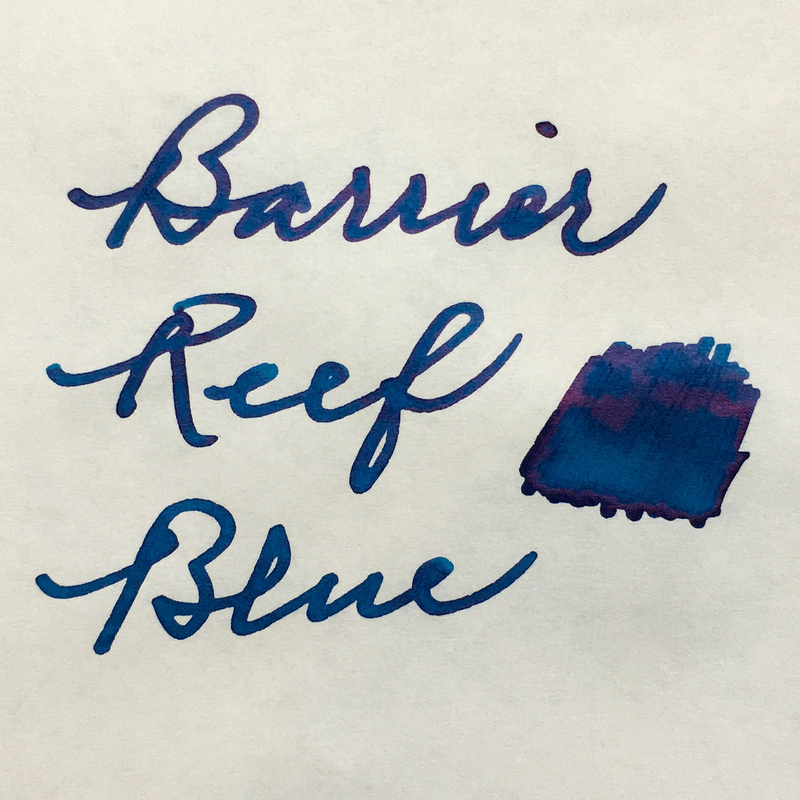 I've been using a Pilot Varsity Blue off and on (similar color to the Visconti, though a bit darker) and even recommending it but, again, while not really the type of blue that appeals to me, I would use it over this one. Of the Blackstones, I'd be more tempted to try Sydney Harbour but, like justaninker, I already have similar colors. It's hard work to tell which is Old Harry when everybody's got boots on. Well, I didn't order, and it has been out of stock at least since Christmas. Can't find another U.S. source; I'm tempted to see what it would cost (shipping, mainly) to get it from Australia or another country.